Digital signage enables the planning and communication of messages in a dynamic and attractive way. But, How does it work? Which are the technologies involved? What will the future developments be? This is the second article of a series designed to explain the best application strategies, and the opportunities offered by this technology. 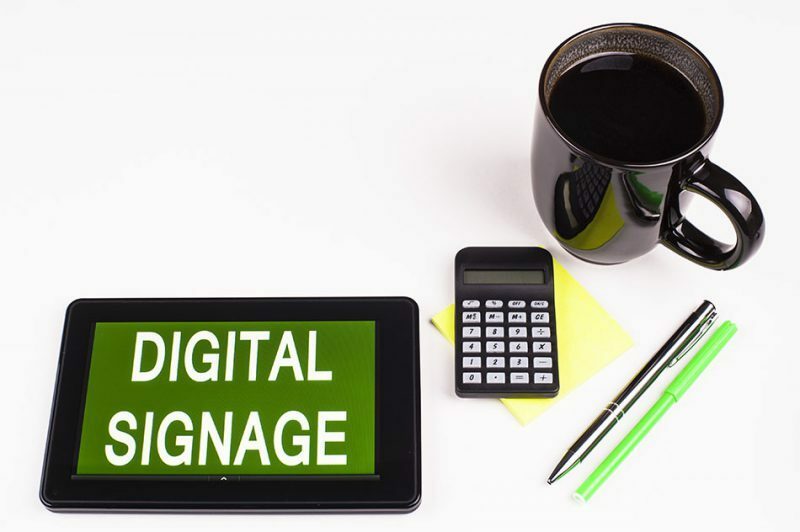 How does digital signage work, and what is the added value of this technology? At the hardware level the system consists of one or more monitors connected to the network through a media player, i.e. a digital reader ( pc, notebook, or a dedicated system). – The connection to the network can be through a standard network cable (CAT5), or a wi-fi and a mobile phone solution. The media player, in turn, is connected to a dedicated server. The digital reader receives the content from the central server and reproduces the contents on one or more displays: these could be classical wall or ceiling screens, wayfinding, totem, or interactive tables, smart windows, smart changing rooms, and even smartphone and tablet . The server receives the contents from a terminal that manages the programming of the messages. Through a Visual Content Management platformit is possible to create contents and to program the reproduction on a single display, or on more displays simultaneously, managing everything remotely. Regarding the software, on the market there are various Visual Content Manager (VCM) solutions. They can be on-site solutions ( run at the company premise), or in cloud, that is as a software as a service which can be managed directly by the company, or – in a partial or complete way by a specialist (off premise), who becomes the provider of reference for the development and the content management. However simple and intuitive the content manager platforms may be, various digital skills are necessary in order to manage the communicationconveyed through the screens, so as to turn them into strategic touch-points of relationship and business. The fact is that it is not only a question of designing and managing the outgoing information, but also managing and interpreting the incoming one. Thanks to the sensors integrated in the monitors, it is in fact possible to track the behaviour and the interaction that the broadcast messages elicit in the viewers. In this way the brands can understand how to improve their services and communication. How does one choose a digital signage system? Before choosing the best solution for one’s company, it is important to understand the aims of the communication and the contents dynamics that, through digital signage, can really make the difference. Digital signage has been developed to communicate, in a more functional and attractive way, advertising messages shown on one or more displays. The evolution of digital technologies has enabled the improvement of the quality, the quantity, and the type of the messages broadcast. By applying the most sophisticated video techniques, digital signage has turned mere information (info) into entertainment. Ushering in the era of Infotainement, VCM combines the multimedia and multi-channel user experience, generating new value for the brands: attraction and engagement can be managed with various dynamics, including fully personalized text, audio, and video messages. How is it done? First of all it is necessary to analyse and study the target audience, location, format, and timing of the communication. The visual contents need to be designed according to the hour and the day in which they are broadcast to convey targeted and relevant messages. Thus, for a digital signage system to work at its best it is essential to apply specialized technical, marketing, copy, and visual skills. Installation and programming are only one factor. To get impeccable videos it is necessary to use creativity to create a compelling narrative, and of course good directing, photographic, and editing skills are essential too. It is also important to have the contribution of an interaction designers team, who know how to adapt the contents to the types of screen and message. How to design effective contents. Digital signage can be used simply to inform about opening and closing times, or even the arrival of a bus or train. In hotels and business centres it can be used to announce meetings, conferences, or to give emergency information in any context. In the retail sector digital signage informs customers about promotions or discounts, or alerts them that it is their turn, thus avoiding long waits and queues. Customers in a restaurant can see information about coffee and cakes in the morning, and ads for aperitifs, and dinner menus in the evening. The added value of digital signage is the fact of being changeable and dynamic. Communication is more effective if advertising messages are interspersed with more general information, e.g. : news, weather reports, videos promoting tourist destinations, or music videos. The communication planning can be quite sophisticated: texts or other elements of the message can be moved or modified to attract the attention of the viewer to a specific area of the screen. Besides, the subdivided screens allow for the alternation of promotional messages with information ones, such as weather reports, or , in the retailing industry, the broadcasting of catwalk shows, or even cookery programs. On a more advanced level digital signage can inform about initiatives or events in real time; indeed, through digital innovation it is possible to devise paths that intersect the customer journey, offering new personalized experiences. An example are products that, thanks to bar codes, Qr codes or RFID or NFC tags on the labels, show details about the items on the screens, or corners or spaces in which the messages on the displays change relative to the rest of the environment, creating communication ecosystems that can facilitate further emotional paths. In this way it is possible to provide visually captivating and highly informative contents, designed to maximize the number of viewings, and increase the conversion rate.